Part of our re-organising the house involved making a corner for Cedar in our nice big bedroom (the room that was the kids shared room last year). 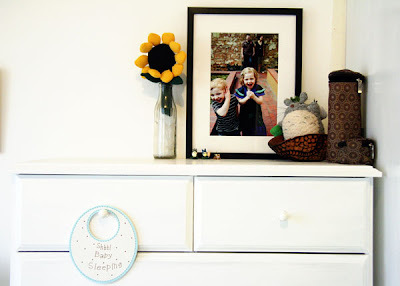 I've been painting the walls white, and repainted some furniture white as well as making the new cushions and window seat cover which I've posted before. 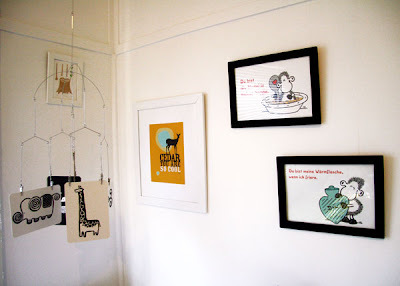 This photo mobile was a pregnancy gift from Kell, the art cards from Wee Gallery (I bought them from The Hip Infant stocktake sale) suit perfectly and are designed for babies. The Cedar poster is by Kal Barteski (same as the one Ash has in his room) and the two Sheepworld pictures are from a calendar Sylvia sent me a couple of years ago - when I was in Germany last I took a liking to Sheepworld :) One says "You are the noodle in my soup" and the other "You are my hot water-bottle when I'm cold" (in German). 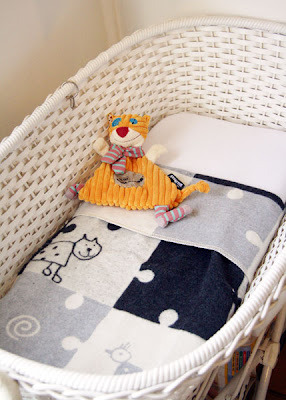 The funky cat comforter is Deglingos and I bought it from Urbanbaby, the gorgeous David Fussenegger blanket was a gift from my sweet friend Kate! The softie sunflower (below) I made for Ben years ago, the photo is one from our anniversary shoot in April with Monkey Gumboots in Hobart. There are a few toys and details around from 'My Neighbour Totoro', one of our fave family movies. The 'Baby Sleeping' sign was a gift from another gorgeous friend Megan - I can see it being very handy to stick on the bedroom door and teach the kids to obey it! 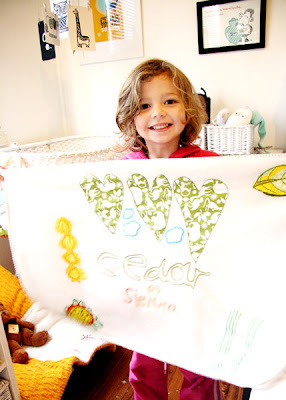 So we worked together on a collaborative blanket - Sienna taking charge of decoration and design, while mummy did the sewing, embroidering, and generally putting it together. 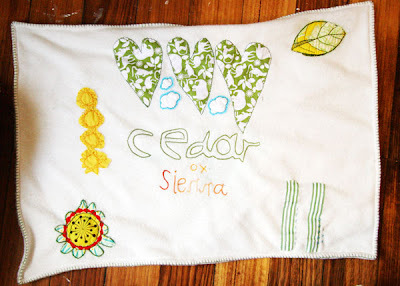 All of the drawings - leaf, flower, hearts and suns - are hand-drawn by Sienna. For the leaf and flower I transferred them to the fabric (in the exact locations she specified, of course!) and added fabric. For the suns and the hearts she drew them directly on the fabric and cut them out herself before sticking them on the blanket, I just embroidered them on. The clouds I cut out for her, she found them a bit tricky, and she stuck them on where she wanted. Whenever I asked 'are you sure?' about where she chose to put things, she was really insistent. "Just where I put them, mummy". Funny girl :) The words she wrote on paper and we cut around it so she could stick it on to the blanket, I traced it with a fabric marker and embroidered them in her colour choices. When I explained that she could add a kiss or hug by using an x and o, she thought that was a fantastic idea. She said it had to be 'ox' - "Because I always say 'cuddle kiss'!". She is quite pleased with the result (I added a little blanket stitch around the edge as well) and wrapped it up today in vintage sheet music. It was a fun project, and really sweet of her. She is so random in her creativity, it's quite interesting to let her lead the way and see what she comes up with! It looks gorgeous Dan and I love Sienna's blanket for Cedar. 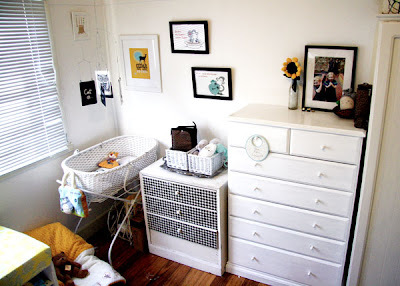 Love that baby corner, I just love all the white, its beautiful.